This feature works with things like clothing (Style Match is what Google calls this) but also works with pictures of things or places. See my capture below of a magazine cover. It picked up that this was the Grand Canal in Venice, Italy. It also works on products and clothing too. If you point it at an piece of clothing, you can get information about it and where to buy it. I tried this out by pointing it at my yet-to-be-eating-for-breakfast Clif Bar and it sorted out what it was and gave me a wide range of purchase options. Next is what Google is calling Smart Text Selection. If you point to text using Google Lens, you will get a blue dot on that text to tap. It will then copy that text for you, which you can paste and then edit in a document. It is pretty straightforward OCR to be honest but in testing this morning, it is very fast and accurate. 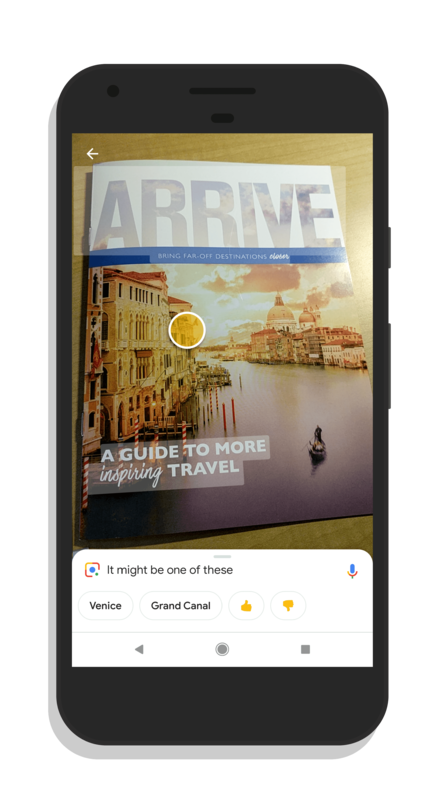 All of this is wrapped up in a new, bright UI for Google Lens which is more fitting of Google Assistant itself and other elements of Android that Google continues to tweak with Material Design. If you are not seeing these new features in Lens yet, it is just a matter of time. Once you do get it, go have a play with it. It is fun and kinda magical.